Astronomers have used the ESO 3.6-metre telescope to identify a planet just like Jupiter orbiting at the same distance from a Sun-like star, HIP 11915. According to current theories, the formation of Jupiter-mass planets plays an important role in shaping the architecture of planetary systems. The existence of a Jupiter-mass planet in a Jupiter-like orbit around a Sun-like star opens the possibility that the system of planets may be similar to our own Solar System. So far, exoplanet surveys have been most sensitive to planetary systems that are populated in their inner regions by massive planets, down to a few times the mass of the Earth. This contrasts with our Solar System, where there are small rocky planets in the inner regions and gas giants like Jupiter farther out. A Brazilian-led team has been targeting Sun-like stars in a bid to find planetary systems similar to our Solar System. The team has now uncovered a planet with a very similar mass to Jupiter, orbiting a Sun-like star, HIP 11915, at almost exactly the same distance as Jupiter. The new discovery was made using HARPS, one of the world’s most precise planet-hunting instruments, mounted on the ESO 3.6-metre telescope at the La Silla Observatory in Chile. Although many planets similar to Jupiter have been found at a variety of distances from Sun-like stars, this newly discovered planet, in terms of both mass and distance from its host star, and in terms of the similarity between the host star and our Sun, is the most accurate analogue yet found for the Sun and Jupiter. The planet’s host, the solar twin HIP 11915, is not only similar inmass to the Sun, but is also about the same age. To further strengthen the similarities, the composition of the star is similar to the Sun’s. The chemical signature of our Sun may be partly marked by the presence of rocky planets in the Solar System, hinting at the possibility of rocky planets also around HIP 11915. The planet Jupiter has been known since ancient times. It is visible to the naked eye in the night sky and can occasionally be seen in the daytime when the Sun is low. To the Babylonians, this object represented their god Marduk. They used Jupiter’s roughly 12-year orbit along the ecliptic to define the constellations of their zodiac. The Romans named it after Jupiter (Latin: Iuppiter, Iūpiter) (also called Jove), the principal god of Roman mythology, whose name comes from the Proto-Indo-European vocative compound *Dyēu-pəter (nominative: *Dyēus-pətēr, meaning “O Father Sky-God”, or “O Father Day-God”). 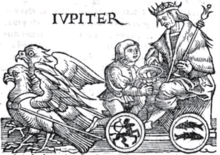 In turn, Jupiter was the counterpart to the mythical Greek Zeus (Ζεύς), also referred to as Dias (Δίας), the planetary name of which is retained in modern Greek. The astronomical symbol for the planet, , is a stylized representation of the god’s lightning bolt. The original Greek deity Zeussupplies the root zeno-, used to form some Jupiter-related words, such as zenographic. Jovian is the adjectival form of Jupiter. The older adjectival form jovial, employed by astrologers in the Middle Ages, has come to mean “happy” or “merry,” moods ascribed to Jupiter’s astrological influence. In the English language, Thursday is derived from “Thor’s day”, with Thor in Germanic mythology being the equivalent Germanic god to the Roman god Jupiter (mythology). The Roman day Jovis was renamed Thursday. In the Central Asian-Turkic myths, Jupiter called as a “Erendiz/Erentüz”, which means “eren(?)+yultuz(star)”. There are many theories about meaning of “eren”. Also, these peoples calculated the period of the orbit of Jupiter as 11 years and 300 days. They believed that some social and natural events connected to Erentüz’s movements on the sky.